Organize and attend funtastic trips! And the best part is, it’s only $10 for the entire year! Becoming a lifetime member: If you have paid to be in the club for 5 years you are eligible to become a lifetime member! Get in touch with us for more information. This way is not as fun as coming in person. But we get it, students are busy so you can conveniently sign up here! This is by far the most fun way to join. Every Wednesday we meet in the courtyard outside of La Val’s Pizza on Northside at 7:30pm. 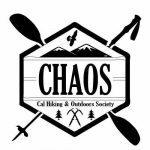 This is a great place to hang out with CHAOS members, eat good food, and talk about the outdoors. Talk to an officer to join! If you can’t make it to the weekly meetings you can join at a Gear Shed hour. Check the calendar to find a time that works for you! We still accept snail mail.